We’ve talked about all sorts of repairs you might encounter while out looking at houses, but what we’ve not addressed — the real elephant in the room — has been the ugly home. Or, the house that needs some interior work. Interior work is tricky since it can often seem like it’s got to be easy, after all those guys on TV do it all the time (and frankly, if Vanilla Ice can handle it, you can, too, right?). Well, curb your enthusiasm a bit. There are definitely interior repairs you can make on your own, there are others you can do with the help of a skilled friend and a night spent watching YouTube videos. Then there are things you really want to leave to the pros. That’s what this final blog in the series is about, trying to sort out which is which. As always, I’m assuming you’re an average everyday sort of person — not a contractor or a person with substantial DIY skill. If you are and you can handle much more than this blog assumes, well knock yourself out. And send us photos, because, frankly, I need inspiration for my own place. You’ve just found the perfect home: it’s in the right neighborhood, it’s the right price, it even has the right look at the curb — but man is it ugly on the inside! Don’t fear! Paint’s one of the easiest things you can possibly do to make a huge difference to the appearance of a house. If there’s wallpaper to deal with, you’ll need to add in the cost of removing that and possibly skim-coating the walls before painting (and if that’s not a thing you’re ready to do, call a pro because it’s easy to mess up), but today wallpaper is much less common than it has been in the past. 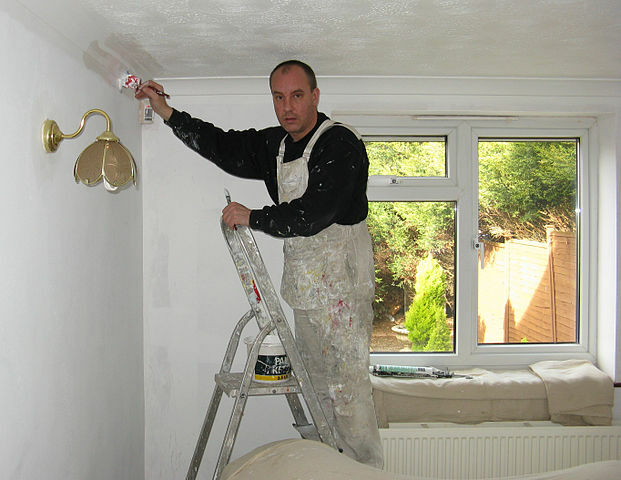 With a steady hand, careful taping and close attention to prep work, you can repaint your own house. You need only understand the basics of painting, watch for drips so your finish is smooth, apply thin layers of paint instead of one massively thick layer and allow at least twice as much time as you assume it should take. A 1,500 square foot house with no furniture should take about a week to paint if you’re being careful, depending on the season (humidity will make a difference on dry times). Most homeowners can learn how to paint the wide open areas. The biggest problem comes when they try to cut in their trim or ceiling edge. You cannot freehand this. Well, I can freehand this, but you can’t — not yet anyway. There are lots of tools out there to help you do it cleanly, and I recommend you get all of them. Small trim rollers, edging guides and even simple painter’s tape and paper can keep you from making a very frustrating and common mistake that will ruin your otherwise functional, even fantastic, paintjob. What it can cost: If you browse your favorite home improvement store’s website, you’ll see paint coming in at all sorts of price points. This can be really confusing if you’ve never bought paint before, but in general you don’t need the most expensive paint to get a really good looking result. My favorite paints are the Olympic paints with the built-in primers, they go on really smooth and I can get away with paying around $25 to $30 a gallon. That might sound like a lot, but when you consider the ease of application, staying power and complete coverage, even with lighter colors, well… you get a lot for the money. If you do it yourself, you’ll end up using about a gallon and a half of paint per 12 foot by 12 foot room, walls only, assuming there’s not something unusual about it. If it hasn’t been painted in a while or the former occupant was a smoker, you may need to double that figure (but if you use the paint with primer, maybe not). Tape, brushes, tarps, ladders and all of that is above and beyond — just don’t buy cheap brushes, you’ll regret it forever. There are lots of good brushes in the $10-$15 range. If you prefer a roller, go to another site for help because honestly, I have no advice there. I end up wasting a lot of paint with them, but they can be good for some wall textures. Now, if you’re not the DIY type and would rather a professional handle your painting needs, HomeAdvisor says that the cost of painting a 10 foot by 12 foot room will cost you between $380 and $790, not including the ceilings or the trim work. There are a lot of other factors that figure into this calculation, including how quickly you need the job done. If you can do it yourself, this is an excellent first time homeowner project. The worst possible thing you can do (provided your surfaces are protected) is gob it up and have to repaint later. Painting is an amazing confidence builder, I recommend it highly! What to do: Get your work clothes on and paint! Seriously, if you’re looking at an ugly house, jump on that bad boy. Don’t hesitate, just jump. Ugly is easy to fix, as you’ll find as you begin to repaint to your tastes. I once showed a house that was severely under market value to four different buyers and every one of them balked because it was, top to bottom, decked out in royal blue and dark walnut paneling. It was one of the most obscene things I’ve ever seen, besides a similar one decked out in purple and pink carpets. Anyway, I couldn’t find a buyer for this place, even though I knew it was a steal (I didn’t have it listed, I just knew a bargain when I saw it). It sat on the market for several months before a Realtor who was also a remodeler happened to walk into it. He bought it immediately and made a sickening profit by simply ripping out the carpets and repainting the walls. So, if it’s ugly, fix it! Ugly is only temporary. This is a bit of a broad one, but it comes up a lot, so I thought it should be touched on. Flooring is a big problem in many homes, either because people don’t realize how horrible their taste actually is or because the choices available in flooring are actually that terrible. I’m not sure which, but it’s probably a combination of both. Anyway, the point is that you’re going to walk into a lot of houses that have terrible flooring — and you’re going to need to make a decision about how to proceed. If the house has hardwood floors under carpets, or hardwoods that need to be refinished, it’s a pretty easy thing to just ask the seller to have them exposed or refinished prior to closing. If the tile, linoleum or carpet is just awful or worn out, it’s sort of another situation. Busted tiles can be a sign of bigger problems, as are bubbling laminated and vinyl flooring. Basically, if the flooring looks like it’s got something weird going on, say something to your Realtor. It might be worn, but it should still basically look like it did at the store. 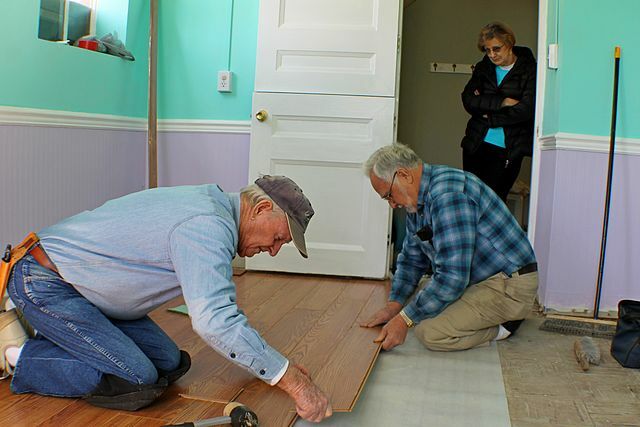 What it can cost: The cost of replacing flooring varies widely, so let’s take it one bite at a time. First, the hardwoods I mentioned up above. To simply pull carpets and expose hardwoods with an original finish costs almost nothing — carpet is cheap to dispose of if you have a truck and access to a dumpster or drop-off site. Sometimes you can even give that stuff away on Craigslist to gardeners, it makes great weed cloth. Having a professional refinish that floor, according to HomeAdvisor, will run around $1,563. You can attempt this yourself, but frankly, it takes a bit of skill to get a hardwood refinish right. Carpet is another inexpensive project that usually won’t make a seller lose their mind if you ask for it in your offer, especially if they knew their rug was worn or stained. HomeAdvisor says the average cost is around $1,500, but frankly, I think that’s too low. You can buy carpet and have it installed for that price — of that I’m certain. Too many people fall into the cheap carpet trap and find that they’ve bought some garbage that lasts a few years at very best. Instead of buying the cheapest thing, research your carpet a little and choose one that will give you some mileage or ask for a recommendation from a real carpet shop. The same goes for vinyl or laminate, really. I hate carpet, just so we’re all showing all our cards, but I hate garbage carpet even more. If you’re needing a tile redo, it’s going to be a big project. It’s also going to cost a bit more than hardwoods or carpet. The cost will depend on how difficult it is to remove the old tile, how damaged the subfloor is after it’s gone, the new tile you choose, how difficult it is to lay, and so on and so forth. I found this chart that can kind of help you get an idea — it’s not cheap, but tile will last you a lifetime if you treat it right and don’t go with something trendy that’s going to be annoyingly hideous in a few years. What to do: If you think you’re financially prepared to deal with reflooring, then jump on a deal. Make an offer that’s your price less the cost of reflooring if the flooring is so awful that no one will buy the house because of it — use this as a leverage tool. If it’s just not your taste, though, don’t overly complicate things because you like gray carpet and the house has brown carpet. That sets the wrong tone for the transaction and your sellers will just think you’re being difficult. Learn to like brown carpet or pay for it out of pocket. Or just don’t buy that house. There are lots of other house. Some probably have gray carpet. Honestly, I didn’t even want to write this header because it’s opening a huge can of worms. There’s so much to this that I can’t really deal with it in this little section — you really need a novel to address it properly. But here we are. And that’s sort of in a place where neither of us really want to be. So let’s get this over with. Sometimes, maybe even often, you’ll walk into a house that has a lot going for it, but the kitchen or the bathroom is just awful. I don’t mean it’s tolerable with a little paint or it has an ugly floor — I mean it’s full on dysfunctional and it’s clear that the previous owner never used this part of the house because how could they? When these situations come up for a first time homebuyer, or even an upgrader, my first piece of advice is to run away. Seriously. This is like the electrical thing from the first part of this series. Sure, you think you can handle gutting a kitchen and oh, how quaint it’ll be to eat out of the microwave and coffee pot in the dining room for a month or a season or a year… but trust me, after two weeks, the fun’s over, you’re done camping in your own house and you really just want to be able to use the garbage disposal, eat a real meal and take a shower. Growing up, my dad loved buying impossible houses and we always lived in the construction zone. There was the stone house on the corner that had to have all the hardwoods refinished one by one while we shuffled rooms around and the Colonial that basically had no kitchen for so many years I can’t even remember… he was remarried and I was in my own home before it was properly outfitted. Those are not the kinds of memories you want to make. Make other memories, like going on vacation to the Alamo or having a big Christmas celebration in your new place. Don’t spend every last dime on your impossible home. What it can cost: I’m not going to bring up sources on this because I’m not joking around. A kitchen remodel can literally cost more than the house it’s in. Kitchen cabinets can cost tens of thousands of dollars, ditto on countertops, professional-grade appliances are thousands of dollars each, not to mention relighting, rewiring and replumbing. I have been in hundred thousand dollar kitchens. They’re not that impressive. Kitchen costs can get out of control before you know it. I didn’t discuss bathrooms as much, mostly because they’re less of a huge expense and more of a huge pain. If you have an extra bathroom that needs remodeled, by all means give it a whack. You’ll probably need a plumber and an electrician, for starters, and possibly a tile guy, drywaller, painter and general contractor. Bathroom remodels won’t usually cost as much as a kitchen, but I’ve also been in some really crazy bathrooms, so never say never. Both are basically open-ended cost projects. What to do: Approach with caution. Better yet, run the other direction. Leave these for more experienced homeowners or construction professionals. They have buddies who can help with free labor and discount supplies. You do not. These monster projects should scare you. Again, I’m lumping things together for space-saving purposes, but these all kind of carry the same warnings, so it’s really just so I don’t repeat myself. When you look at a house and you see that there’s an unfinished space — a basement or an enclosed porch or an attic — does your heart go pitter-patter? Do you dream of making that empty hole into something special and unique? Are you certain you’re the one that will finally make use of that unused area? Hate to burst your bubble, but back away. Put the hammer down, get away from the table saw and come back to reality. It is absolutely possible to refinish these unfinished spaces, but I’ve seen so many poorly finished unfinished spaces that I’m going to tell you right now that you have no idea what you’re getting into. In fact, if the whole reason you want to buy this house is because of “the potential,” just keep shopping. One of two things will happen with your attic/basement/garage project: you’ll never get around to doing it or you will and the results will be far less exciting than you had hoped. So, unless you can afford to hire a professional to refinish your spaces, just don’t even think about it. If that house won’t work for you without that unfinished space finished, don’t do it. Don’t do it. Don’t do it. It’s a trap. A money trap. What it can cost: First of all, there’s a lot more to finishing your unfinished space than throwing up a few two by fours and some drywall and calling it good. A whole lot more. The new space has to be integrated into the rest of the house fully, meaning that all the systems, the way the house breathes and functions and handles fire suppression and everything other thing has to work with that new space. It’s not a place unto itself. That being said, finishing a basement can cost you $40k or more, according to HomeAdvisor. ThisOldHouse has made a list of some things to consider before finishing a small attic space that they estimate can cost $10k to $25k. What to do: Like with extensive kitchen and bathroom remodeling, just don’t. There are lots of houses for sale, find one you like. If you can’t find one you like, consider a custom build. Surely you’ll spend less on a custom-constructed home than you’d spend on buying a house and then finishing unfinished space. Interior repairs like painting or putting in new carpet are great ways to personalize your space, but if you try to jump into the heavy stuff before you’re ready, you’ll end up with a house you hate, an incredible amount of money you wish you’d have spent on a vacation to Goa and a whole lot of anger. All joking aside, this is how a lot of people lose their homes. It’s tragic and it’s not something I ever want to encourage. Stay just outside your comfort zone, not on a planet orbiting a distant star that can barely be seen from your comfort zone. Choose a house that’s ugly, but not ugly beyond your skill level. That’s my advice for all buyers, in all times and markets. Ugly homes are easy to cure, removing ugly is the most cost-effective home improvement you’ll ever make. Leave kitchen remodels and attic additions and other huge frightening projects to people with the right experience and skill set to handle them without turning their dream homes into a nightmare for everyone involved. Kristi Waterworth was an active Realtor during the boom and bust years of the late 1990s and early to mid-2000s - she witnessed the market collapse from a brokerage in Springfield, Missouri, where she specialized as a buyer's agent. Waterworth was a trained journalist before entering the real estate industry, lending her a unique perspective and a practical approach to housing and market analysis.